A binary classifier makes decisions with confidence levels. Usually it’s imperfect: if you put a decision threshold anywhere, items will fall on the wrong side — errors. I made this a diagram a while ago for Turker voting; same principle applies for any binary classifier. So there are a zillion ways to evaluate a binary classifier. Accuracy? Accuracy on different item types (sens, spec)? 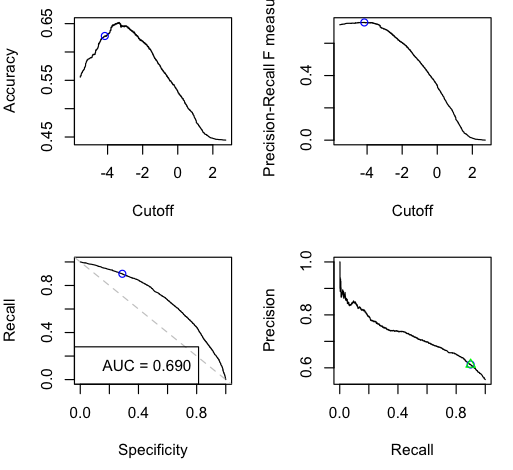 Accuracy on different classifier decisions (prec, npv)? And worse, over the years every field has given these metrics different names. Signal detection, bioinformatics, medicine, statistics, machine learning, and more I’m sure. But in R, there’s the excellent ROCR package to compute and visualize all the different metrics. F-score — I want to kill this graph and replace it with something more useful. Kappa? But positionally it’s nice here: cutoff on the x-axis like the topleft, but it’s a precision/recall metric so goes along with the bottomright. I added the function to my R utilities file, here: dlanalysis/util.R. Some people in machine learning like to use standalone programs like PERF to compute all these metrics. R is better if you know it. You can calculate all sorts of things with it. Above I was using R for the evaluation of the outputs of a command-line classifier, importing them easily with scan() and scan(pipe(“cut -f1 < data.svmlight_format”)). The best Wikipedia page to start reading about the zillions of all of these interrelated confusion matrix metrics might be the the ROC page. If you want to see lots and lots more evaluation metrics, look at the “extended classifier evaluation” section of LingPipe’s sentiment analysis tutorial. And once you get into multiclass and such, all complexity hell breaks loose. I’m loving R for this kind of stuff because of the graphics. It’s so much easier to understand that way than in a table of numbers. I’d suggest (a) putting recall on the horizontal axis in both of the bottom graphs, (b) making the graphs square rather than rectangular, and (c) fixing axes to the range [0,1]. In a summary plot like this, I’d also like to see number of positive and negative examples in the gold standard, the name of the data set, name of classifier and any params that can be indicated. I always find myself fishing for that in papers. You might also indicate graphs are uninterpolated, though that’s obvious from looking at PR. There’s no reason you couldn’t overlay multiple evals here in different colors, too. I’d love to see posterior intervals in addition to single numbers in the plots. Wouldn’t a simple bootstrap work and be simple to implement in R? Of course, that’d get hopelessly messy and prone to misinterpretation with multiple evals on the same plot. 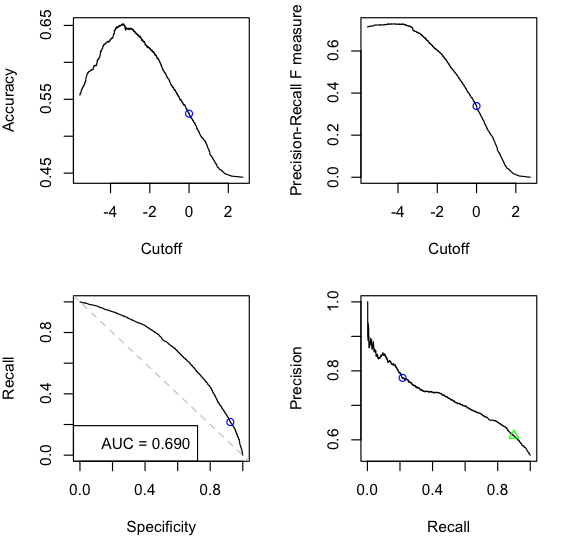 Given our focus on high recall, we’re often zooming in on the 95-100% recall section of the graph, but presumably that’s all settable as in the rest of R’s plotting functions. Thanks for the LingPipe pointer — there’s also extensive discussion of classifier evaluation in our javadoc for ConfusionMatrix, PrecisionRecallEvaluation, and ScoredPrecisionRecallEvaluation. a handy utility. However, have you left out a “last” function i.e. Rob: oops, sorry I forgot. Yup that’s it.